If you have an Intel-based laptop (Centrino and above) and you’re frequently away from your desk, you might want to check out Notebook Hardware Control. In a nutshell, it’s a Windows application designed to extend your battery life by reducing the power consumption of your laptop’s components. It does this by allowing you to change various settings in your hardware and software. Obvious things like lowering the brightness of your screen, allowing your hard drive to go to sleep, and clocking down your processor are covered. But there’s other useful features such as the facility to under-volt your processor to consume less energy, and settings to reduce the punch of your graphics processor. 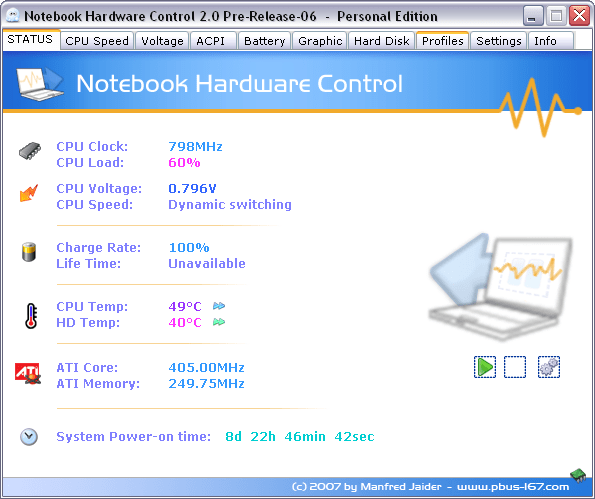 I’ve found I get at least 30 minutes more battery life on my Intel Centrino 1.83Ghz. Try it out, and let me know how much extra battery life you get from it! Download NHC here. To use it you’ll need Microsoft’s .NET Framework Version 2.0 or newer installed.